The brouhaha over the latest “evidence” in the decade-old JonBenet Ramsey case-John Mark Karr’s “confession” that he murdered the child beauty queen-included claims that the late psychic detective Dorothy Allison had once foreseen Karr’s likeness and other identifying details. In addition to the envisioned portrait, Allison predicted the killer would have “connections” to Germany and Georgia, and gave additional details. However, just as a New Jersey police captain had said of her other “cases,” Allison’s predictions “were difficult to verify when initially given.” Allison followed the formula utilized by other reputed psychic sleuths: take advantage of the publicity engendered by a high-profile case, and make numerous pronouncements, such that-when the true facts are subsequently established-the statements can be interpreted accordingly. (For example, “water” can later be identified with a nearby stream, lake, water tower, etc.) This clever technique of after-the-fact matching is called retrofitting, and it has fooled even seasoned detectives. Following John Mark Karr’s arrest, Allison’s sketch prompted a bout of retrofitting from credulous reporters and New Age adherents. For example, according to Brad Parks of the Newark, New Jersey, newspaper, The Star-Ledger : “The sketch her vision helped create speaks for itself. About the only thing she got wrong was Karr’s hair, which is parted to the side in her sketch but swept back in real life.” Skeptics like me received communications from psychic believers crowing about Allison’s perceived success in “identifying” JonBenet’s killer. 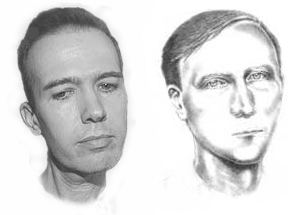 However, even before Mr. Karr’s story began to be questioned by more experienced writers and investigators, it was apparent that the resemblance between Karr and Allison’s imagined intruder-murderer (see Figure 1) was actually little more than that between countless other clean-shaven white men. Tipped off to the controversy by my mentor, James “The Amazing” Randi, I examined the set of pictures and reconsidered Allison’s 1998 pronouncements. In recognizing profound differences between the two pictures-not only the hair but the entire shape of the head and other features, such as Karr’s much fuller lower lip-I considered whether to point them out in text or to compare them in a diagram. I finally decided to create a new field, “forensic caricaturing”: See Figure 2. With this method the differences are enhanced so that they may be more readily perceived. As to Allison’s statement that JonBenet’s killer had “connections” to Georgia and Germany”-and the fact that Karr had links to both areas-many people could be so connected, myself among them. Moreover, one must avoid the fallacy of counting the hits while ignoring the misses. Whereas Allison’s perceiving of the numbers 2-8-9 might easily be retrofitted to almost anyone, other statements she made regarding the crime are not so easily matchable. In insisting on the Ramseys’ innocence, she stated that the real killer was a former handyman. She told Leeza Gibbons that she had divined the names “Martin” and “Irving”-identifying the latter as “the one I think that did this.” It would seem difficult to retrofit “Irving” as “John Mark Karr,” but perhaps believers in Dorothy Allison’s clairvoyant ability will somehow manage or will rationalize the discrepancy. Meanwhile, Karr’s purported guilt is increasingly being doubted, and perhaps the issue of Allison’s accuracy in this instance will become moot. Yet that is all the more reason to focus on the perceived match of Karr and the Allison sketch. The mismatch serves as a warning against the tendency to retrofit, and against the temptation to accept uncritically the imaginings of a failed clairvoyant. Nickell, Joe. 2004. The Mystery Chronicles . Lexington, Ky.: The University Press of Kentucky. Parks, Brad. 2006. Psychic’s 1998 vision comes to life. Newark, New Jersey: The Star-Ledger , August 18.